Inner-city apartment residents have the option to bulk purchase higher-speed connections from NBN Co under the government-owned company’s plan to add nearly 4 million premises to its network this year. There has recently been an update reported that Fibre to the Premises (FTTP), sometimes called Fibre to the Home, may become available, however at a cost. As you might notice, NBN Fibre to the Premises is AWESOME! It’s important to find out whether you actually need a different NBN network technology at your premises. The reality is, you may just need to speak to your phone and internet service provider about a higher speed or different equipment at your home or business to transform your online experience into something spectacular. To save time and money, check with your phone or internet service provider whether you are on the right plan with the right speed. The cost to change technology infrastructure is dependent upon the size and complexity of the project. Each switch will vary depending on your location and infrastructure availability. It can range from a few thousand dollars to tens of thousands for large complex areas. If you apply, and your premises is deemed eligible and you then proceed, NBN will charge a $660 (incl GST) Build Quote Fee which provides a fixed quote for the build of the NBN network. Applications are only processed once the NBN network technology for your area has been deployed. 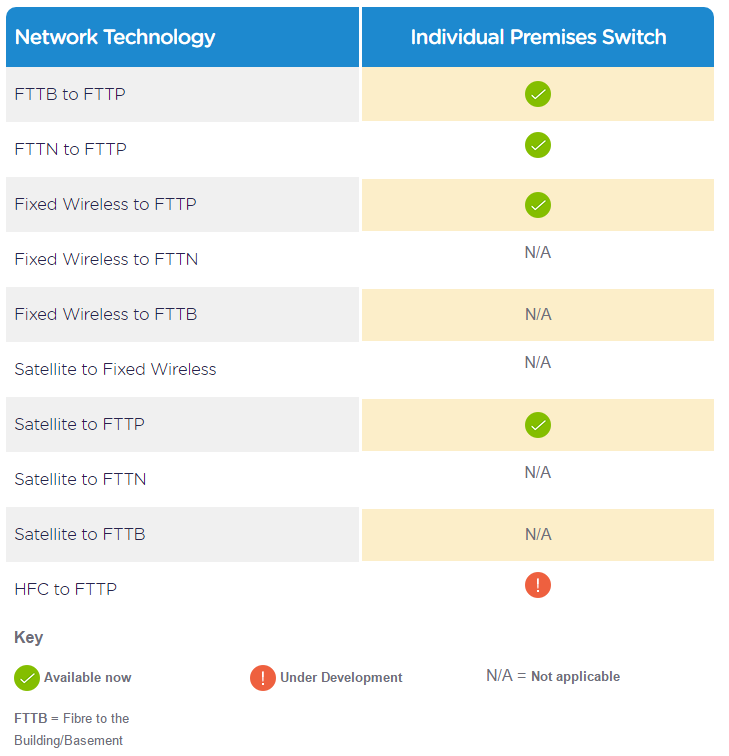 The table below shows the types of NBN network technology eligible for the Individual Premises Switch. If you need to determine which NBN network technology you have or is planned for your area, contact your phone or internet service provider to find out. Your preferred service provider can also advise on the speed plan or in-home equipment that suits your needs. If still needed, they can apply for an Individual Premises Switch on your behalf. All premises submitting an application must be connected to the NBN active network coverage. The applicant must be the owner of the premises or the owner’s authorised representative. If you are in a rental property, NBN recommends that you discuss your plans with your landlord and ensure you have their permission to apply on their behalf. Applicants may include individuals, businesses, local government authorities, state government organisations and phone or internet service providers on behalf of individuals. In FTTN and FTTB areas, applications will only be processed once the originally planned network has been deployed to the premises. In Satellite and Fixed Wireless areas, applications will only be processed once the fixed line network adjacent to the individual premises has been deployed. The extent to which Individual Premises Switch can be performed within NBN’s existing design and construction regime. The availability of third-party infrastructure and its relative cost. The timing of the application and proximity to already constructed NBN Infrastructure. You can read more about Fibre to the Premises (FTTP) for Multi Unit Dwellings on at The Sydney Morning Herald. Source used for article: NBN Co.
Unsure what this means for you?